Here at Specilaised Tank Services, it is our job to make the important purchase and delivery of your new water tank as simple and efficient as we can. 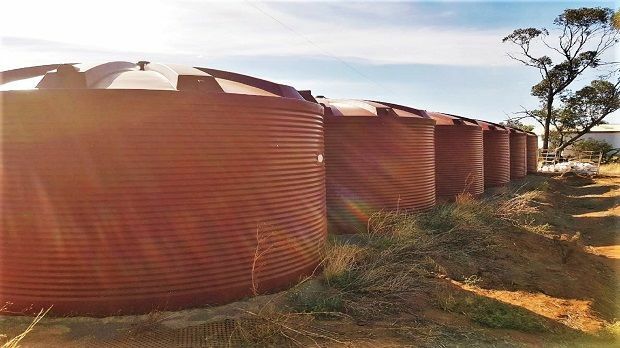 We recommend and install only Polymaster Water Tanks, they have been around for over twenty years with the original owners still in place, as a quality assured company Polymaster has been at the fore front of industry endorsed product certified designs. Specialised Tank Services will provide you with a first-class tank you can rely on for years to come. We can supply your tank only or organise the complete package from the earthworks through to plumbing with a certificate. Just ask our friendly team for a no obligation proposal if these services are required. With choices of Colourbond matched colours, your new water tank will be perfectly blended to your new home with ease.The standard range take the guesswork out of matching your tank colour with your exterior walls, guttering or roofing. No wonder this range is Australia's favourtie. If you're looking for even more colour options, you'll find other exciting Colourbond shade in our optional range. With a little extra imagination you can create a visual look in any outdoor area by choosing a contrasting colour or complementary colour match. Certified Round Tanks up to 50,000Litres, all backed up by a 20 Year Warranty! One piece construction with no joints, seam or part lines down the walls; and the top of the tanks aren't removed for transport. Traditional corrugated wall profile can't be substituted for strength and appearance. The self-supporting roof design has a certified patent and registered design, because of this it eliminated the need of a support pole for the roof. Molded lugs un the roof of the water tank makes lifting easy and can also be used for tie down points. Food grade polyethylene used for all Polymaster rainwater tank are also UV stabilized in all colours. Ideal for narrow spaces, Polymaster's slim tanks are a very popular household water tank, perfect for down the side of your home. Available in 600L, 1,050L, 2,000L, 2,100L, 3,000L and 5,000L capacities, there is a tank to suit your application. Choose from the Standard PolyChoice brand, or our Premium range for extra strength. 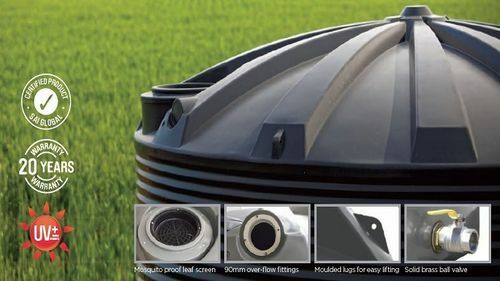 These slim poly tanks are available with pumps to suit any application, such as for household use (single-storey, double-storey or multi-storey dwellings) or garden purposes. The premium range of slimline tanks are the toughest in the industry, with extra thick walls. If you want quality, look no further than the Premium range from Polymaster, Manufactured with strength in the forefront, these great looking premium quality tank will suit those narrow spaces around the sides of your home and are available in 22 Colourbon colours, so you can match your house. 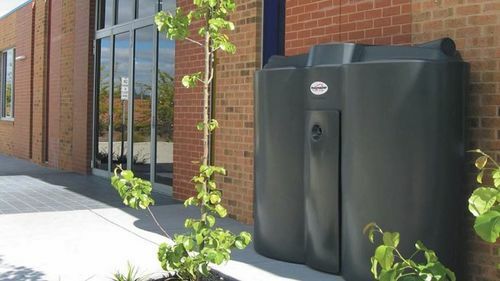 Save your money on your water bill by harvesting rain water in a Polymaster rainwater tank to use for many applications. If you are looking for more information on any product from Polymaster, please do not hesitate to contact us by calling our office number on (03) 5334 6688. If you wish to investigate further, please visit the Polymaster website.